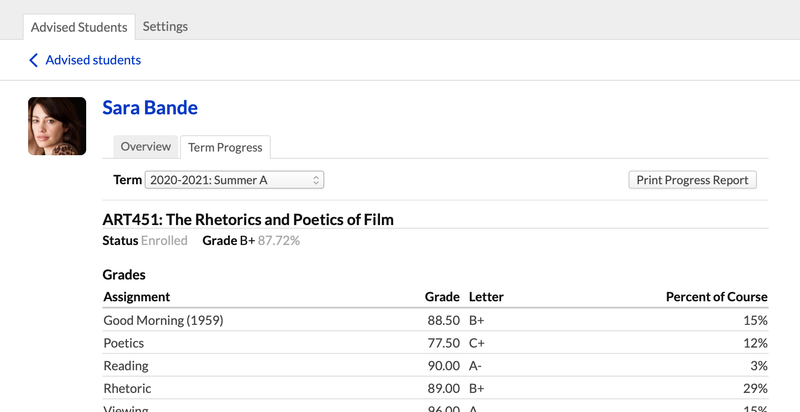 In Advising > Advised Students, you'll find the new Term Progress view when you click a student's name. It includes all of the assignment grades and attendance records for each of the student's courses in the selected term. Aaaaannnd... it has a PRINT button! You can now use html and include up to 5,000 characters in a custom initial application email. You can now bulk-apply discipline records to students using the Financial Aid > Reporting > Academic Progress report. Test question analysis in courses now has a category filter. If you hate library reviews—or if you love them, but hate what bad examples do to public perceptions of the art form—you can now delete them! Updated the email we send when you log in from a new device. If you're using the Canvas integration, you can now create Canvas usernames based on the student's primary email address—there's a new setting that controls this in Account > Integrations. You can hide your school's name on your online applications (Admissions > Settings > Other Settings is the place to do that). When submitting an application via the API, you can now include an address. Tweaked a few things with award letter variables to make sure that the disbursement amounts shown reflected any refunds to source. The Tin Can importer would sometimes hang itself up in the middle of an import, so we made it more betterer at importing stuff. Course Evaluation reports now export as CSVs because the old XLS exports frequently gave up the ghost. If you wanted to import a file from another course into a Lesson, the function just wasn't functioning. Fixed. If you hate showing students the Overdue notices when they have overdue balances, you can now turn those off altogether—for all students or for individual students. I can't seem to find the setting to change the school text and logo on the online applications. Would this require custom CSS, or is there a place to upload an image? I mis-reported the nature of the change—we only added the option to hide the name of the school on the application. I've since corrected the release notes. Look for "Hide organization name on application" in Admissions > Settings > Other Settings.